To state the obvious, nobody enjoys pain. The team at Jordan Landing Smiles knows this, which is why we provide sedation dentistry to those patients who need it. Some of the most common pain-relieving medications used in dental offices around the country are topical anesthetics. These are swabbed directly onto mouth tissue and numb the surface layers. Topical anesthetics can decrease the pain of mouth sores, or they can be applied to prepare the mouth for an injection. Local anesthetics are injected into mouth tissue (usually the gums) to block the nerve sensations to specific areas of the mouth. Dentists ordinarily numb the mouth in this way before filling cavities, treating gum disease, or performing cosmetic dentistry procedures. More involved dental procedures may require nitrous oxide or even general anesthesia. Dentists usually recommend an OTC analgesic to relieve pain after a dental visit. These medications include aspirin, ibuprofen, and acetaminophen. Because your dentist will possibly administer a pain reliever during the dental visit or prescribe something for you to take after the procedure, make sure you jot down a complete list of medications you are taking, including herbal supplements, before each appointment. 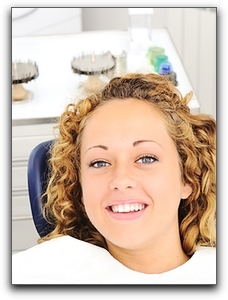 In addition to sedation dentistry, Jordan Landing Smiles provides general dentistry. Schedule an appointment with us today.